The New Jersey Articles of Incorporation are presented in the form of the “New Jersey Division of Revenue’s Public Records Filing For New Business Entity.” This is considered a required document when any entity chooses to conduct its corporate business in the State of New Jersey. 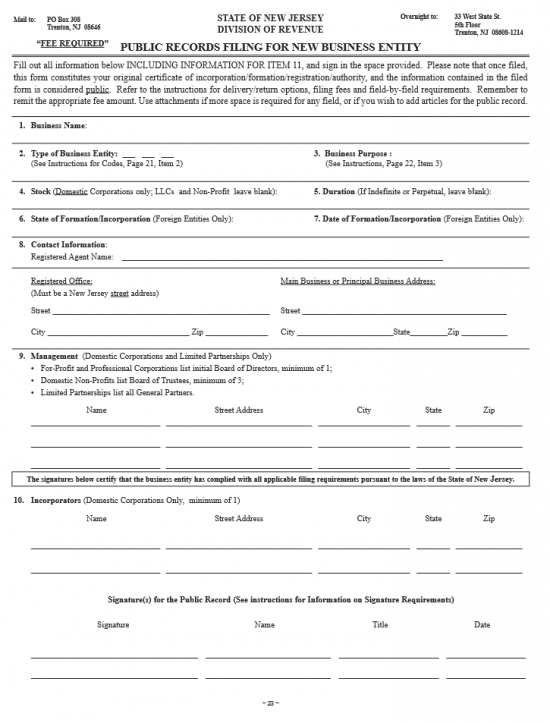 That is, if you are forming a corporation in the State of New Jersey (of any kind) or if you are a foreign corporation wishing to conduct business in the State of New Jersey, you will need to complete and submit the “New Jersey Division of Revenue’s Public Records Filing For New Business Entity.” You may file this form as a hardcopy document or you may use the State of New Jersey Division of Revenue and Enterprise Services Business Formation web page to form and register your corporation online (https://www.njportal.com/DOR/BusinessFormation/Home/Welcome). In either case, you should be prepared to submit all information required for the articles of incorporation or formation along with the Filing Fee. The Filing Fee will depend upon the type of entity being formed. If the corporation being formed is a Domestic For-Profit Corporation of any type or a Foreign Corporation of any type, the Filing Fee will be $125.00. If the entity being formed is a Domestic Nonprofit Corporation then the Filing Fee will be $75.00. The method of payment will depend strictly upon the method of filing. That is, if you are filing by mail then you may pay with a check or money order made payable to “Treasurer, State of NJ.” You may choose to pay with a credit card provided you supply the Credit Card Number, Expiration Date, and Full Name and Full Address of the card holder. You may also choose to pay with a Depository Account assigned by the Treasurer of the State of New Jersey provided you provide the account Number and Full Name and Address of this account. Such information may be noted with a cover sheet. You may also choose to Fax in your articles (if you are filing with a hardcopy document), to (609) 984-6851. You may not pay with a check if you Fax in your articles. If you do fax in your documents, make sure the cover sheet sent is titled “New Jersey Department of the Treasury, Division of Revenue and Enterprise Services, Facsimile Filing Service Request.” This cover sheet must include the Name of the Transmitter (if a business, include the business name), the submission date, the payment information (depository account or credit card number and expiration date) and a service description. In this case Certificate of Incorporation may be sufficient. 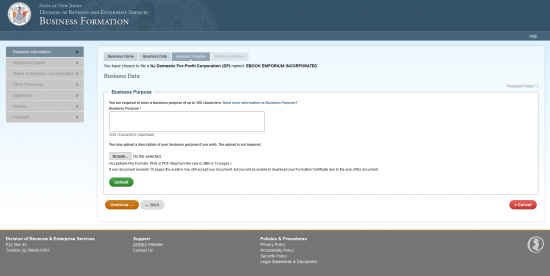 It is worth noting that while New Jersey is transitioning from the paper system to a purely online system, this document will still be considered a valid filing and you do not need to submit it while simultaneously filing online. That is, file once and with one method. You will need to file For-Profit Articles in duplicate and Non-Profit Articles in triplicate, if filing for either type of entity by mail or over the counter. Expediting is also available (though processing will average 2-3 business days depending on the department’s workload). There will be an additional expedited service (for corporations) of $50.00 for Same Day Service, $500.00 for two hour service, and $1,000.00 for one hour services. Such fees are in addition to the Filing Fee. Any request for expedited service must be done in writing or in person. 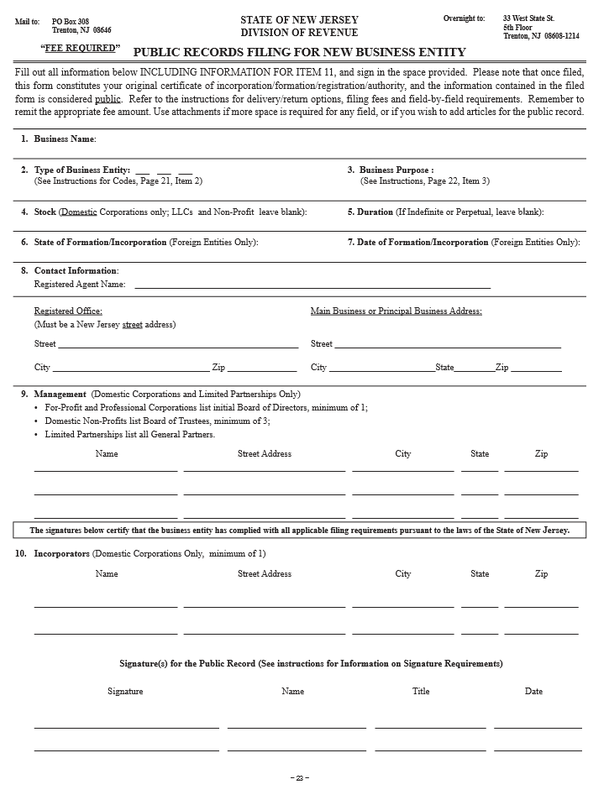 Step 1 - Select the “Download Form” button above to download the “New Jersey Division of Revenue’s Public Records Filing For New Business Entity.” You may either use a PDF program to enter the information required or you may choose to print this document then fill it in using a type writer. Do not fill in this form by hand. Step 2 - Once you are ready to fill out this form, locate Item 1. Here, you must enter the Name the corporation shall operate under and be known as in the New Jersey Division of Revenue’s Public Record. Make sure to include a word of incorporation as required. This may be the word Corporation, Incorporated or any acceptable abbreviation. Step 3 - Next you will need to define the type of entity being formed in Item 2. This will require inputting the appropriate code. A domestic for-profit corporation operating under New Jersey Statutes Title 14 A must enter the code DP, a domestic professional corporation will need to input the code PA, a foreign for-profit corporation (professional or otherwise) will need to enter the code FR, a foreign profit corporation that must operate under an assumed name will need to input the code DBA, a domestic non-profit corporation will need to enter the code NP, and a foreign non-profit corporation will need to enter the code NF. Step 4 - In Item 3, you will need to define the purpose of this corporation. Make sure you are specific as to why this corporation is being formed and how it will operate. Domestic for-profit corporations will have the option to leave this area blank with the understanding the corporation will be formed under the general purpose clause as defined in the New Jersey Statutes Title 14A. Step 5 - Item 4 is geared specifically to domestic for-profit corporations. Here, a domestic for-profit corporation must report the total number of shares it has been authorized to issue. Step 7 - Item 6 applies only to foreign corporations. 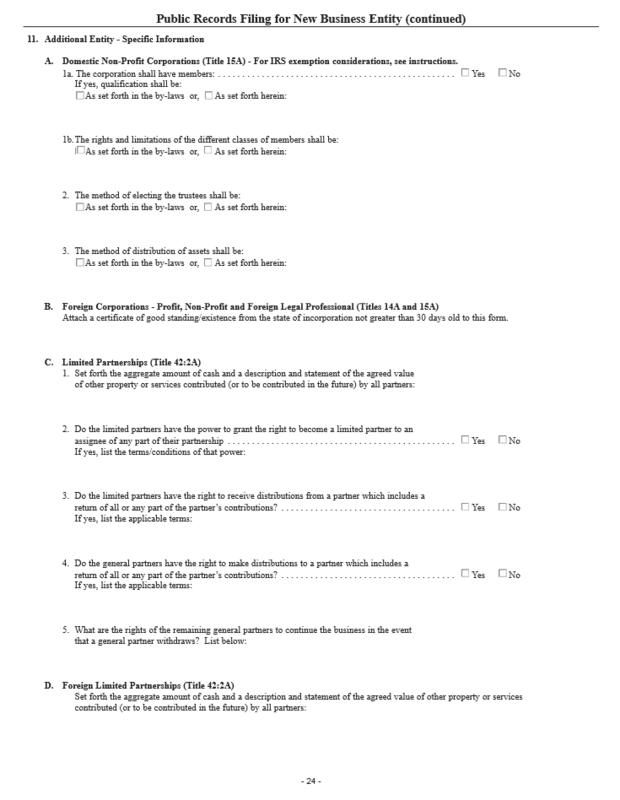 If this is a foreign corporation submitting a registration so that it may do business in the State of New Jersey then report the State of Formation on the blank space provided. That is the jurisdiction where the foreign corporation incorporated. Step 8 - Item 7 also applies only to foreign corporations. 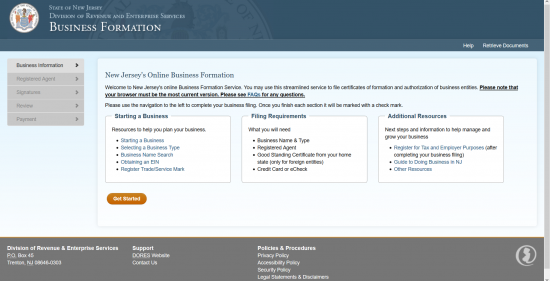 Here, you will need to report the Date of Incorporation in the foreign entities home state. 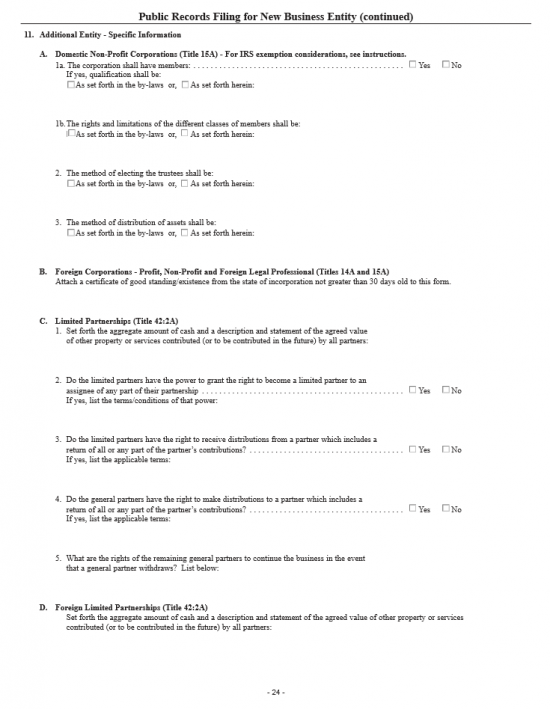 Step 9 - Item 8, which is divided into three sections, will apply to all entities filing this document. On the blank space provided in the first section, enter the Full Name of the Registered Agent. Step 10 - In the second section of Item 8, labeled “Registered Office,” report the Full Street Address of the Registered Agent’s Office. This must be a physical geographical location in the State of New Jersey. This section will be located in the left column of Item 8. Step 11 - The column on the right in Item 8, labeled “Main Business or Principal Business Address,” will require the Full Address of the Principal Office of the filing entity. Step 12 - Item 9, or “Management,” is geared towards domestic corporation. This item requires a definition for who precisely will be held responsible for decisions regarding the filing or forming entity’s behavior, actions, and operations. If this entity is a for-profit or professional corporation (domestic or foreign) then, enter the Full Name and Full Address of each Director serving on the Board of Directors of this corporation. If this is a domestic non-profit corporation then enter the Full Name and Full Address of each member on the Board of Trustees. Step 13 - Below Item 9 will be several columns: Signature, Name, Title, and Date. This section will only apply to the Incorporators of a domestic corporation being formed by this document. Here, each Incorporator must Sign his/her Name in the Signature column, Print his/her Name in the Name column, report his/her Title, and provide a Signature Date in the Date column. Step 14 - Item 11, on the next page, will require additional information. The first section, 11A, will gear itself to domestic nonprofit corporations. In the first section of Item 11A shall require a definition for whether has members or not. If so then mark the box labeled “Yes” and if not mark the box labeled “No.” If the nonprofit will have members then mark the box, below this question, if qualifications for membership shall be described in the by-laws. If the qualifications for membership are set by this document then mark the box labeled “As set forth herein” and report these qualifications. Step 15 - In section 1b of 11A, report the specific rights or limitations of different classes of members are covered in the by-laws by marking the box labeled “As set forth in the by-laws.” If they are to be set in this document then place a mark in the box labeled “As set forth herein” and enter these specifics in the space provided. Step 16 - In section 2 of 11A, check the first box if the by-laws shall define the method of electing trustees. If not, then select the second box and enter this method in the space provided. Step 17 - In section 3 of 11A, report if the distribution of assets are set forth in the by-laws by marking the first box. If they are to be defined here, then mark the second box, and describe the process in the space provided. Step 18 - Section 11B is aimed at foreign corporations. If a foreign corporation is the filing entity, then a Certificate of Existence 30 days old or less and issued by the governing authority of the entity’s home state must be attached. Step 19 - Organize all relevant document then submit New Jersey Division of Revenue’s Public Records Filing For New Business Entity. You may submit by mail, fax, or over the counter. Make sure you pay for the appropriate filing fee with a method appropriate to your filing method (i.e. do not pay by check if you are faxing). Domestic Profit Corporations and Foreign Corporations of any kind will have a Filing Fee of $125.00 while Domestic Nonprofit Corporations will have a Filing Fee of $75.00. Note: Expedited Service Requests of any kind will carry an additional $15.00 Fee for fax deliver of each filing being expedited plus $1.00 for each additional page. 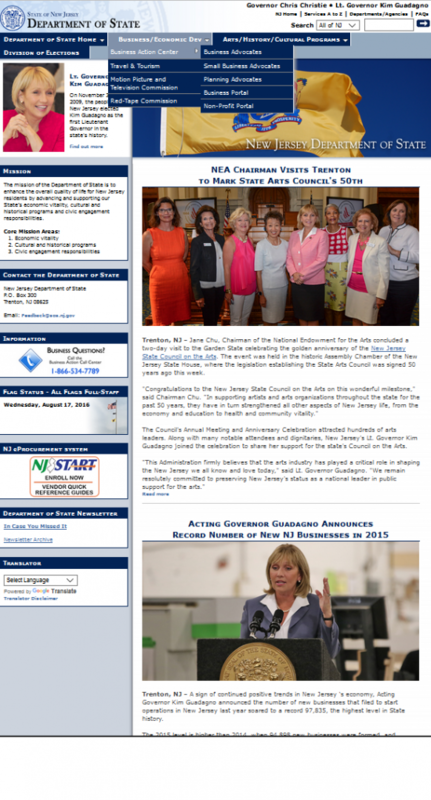 Step 1 - Go to the State of New Jersey Department of State’s home page (http://www.state.nj.us/state/). Then locate menu item on the top labeled “Business/Economic Dev.” This is a drop down list. 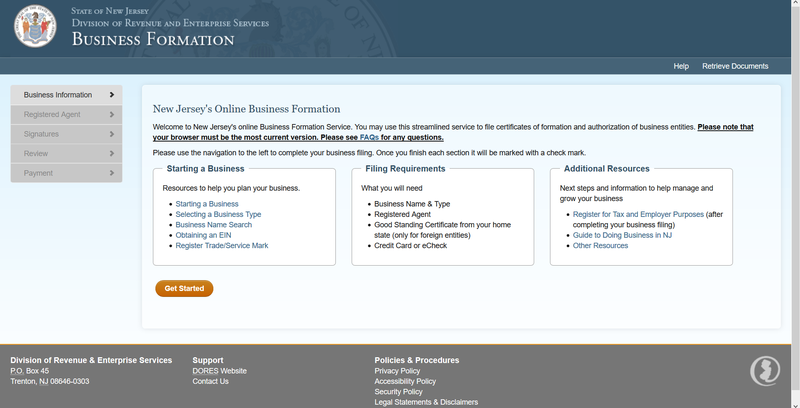 From the drop down item labeled “Business Action Center,” select the item “Business Portal” to form a profit corporation. Step 3 - Read the introduction as it will provide some information regarding this site and its services. 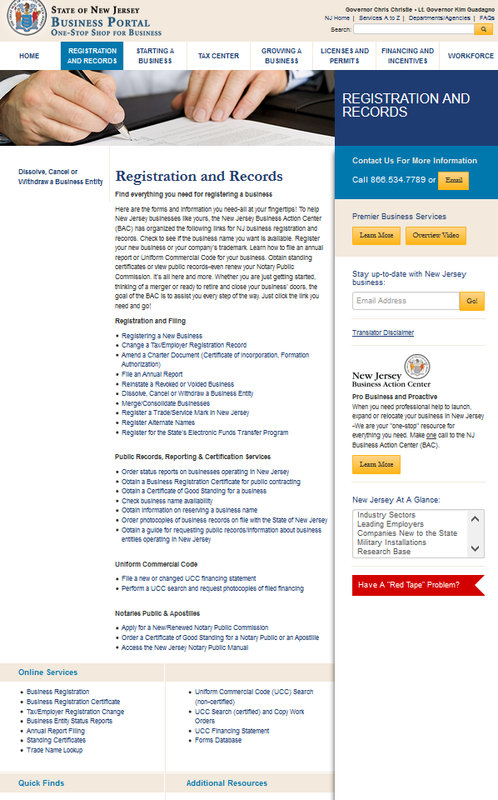 When you are ready, locate the link, under the heading “Registration and Filing,” labeled “Registering a New Business” and select it. 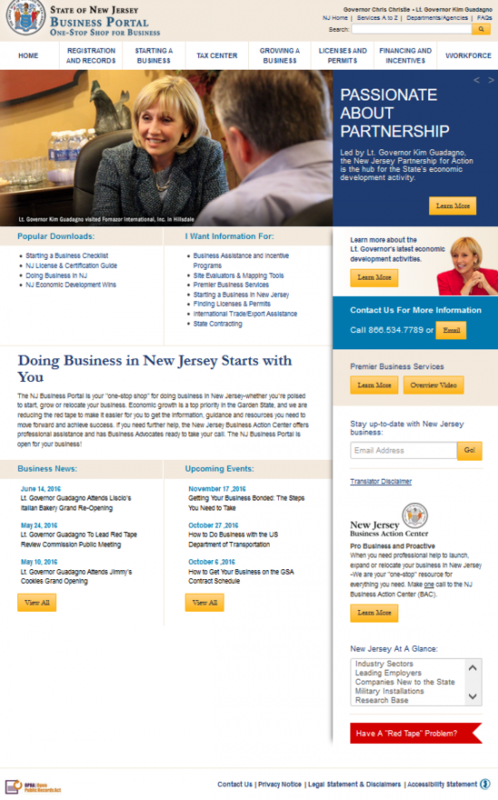 This will take you to the State of New Jersey Department of the Trasury Formation and Registration page for new businesses. You should read all of this page, then select the link, “Filing Certificates of Formation,” found in the “Step 1 – Recording New Business Entities” section. 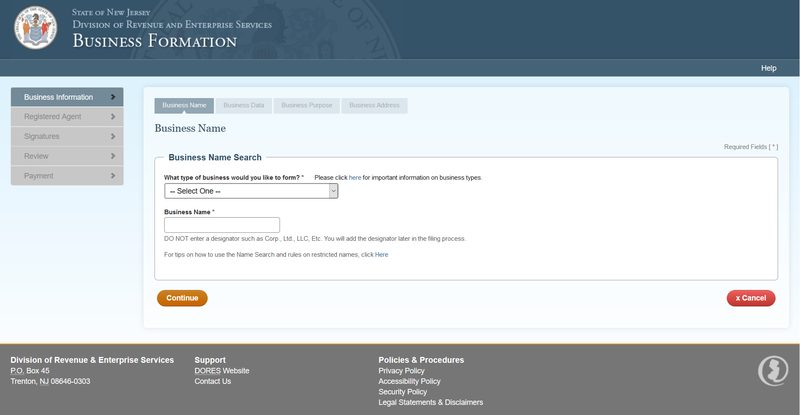 Step 4 - There will be more information on this page that you should be familiar with before filing your new entity. 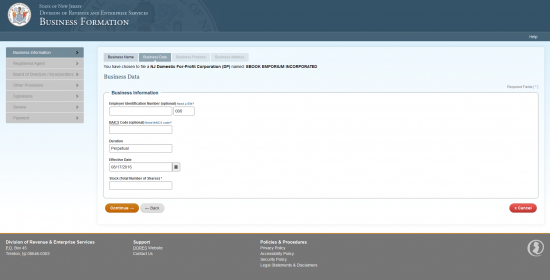 When you are ready, locate the paragraph in the “Online Filing” section. 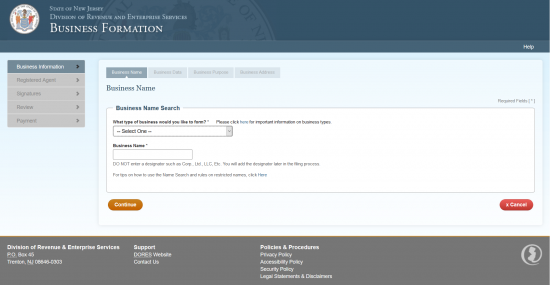 From here, locate the word “online,” this will be a link to the online form you must use to register your business. Step 5 - The State of New Jersey Division of Revenue and Enterprise Services Business Formation page is the springboard to input your information. Along the left locate the link labeled “Business Information” and select it. Step 6 - In the “Business Name Search” section, locate the drop down list beneath the statement “What type of business would you like to form?” Select the type of entity being formed by this form. For our purposes, select NJ Domestic For-Profit Corporation. Then enter the name of the corporation you are forming in the text field labeled “Business Name.” Once you have done this select the “Continue” button. (Do not add a corporate designator to the name at this stage). 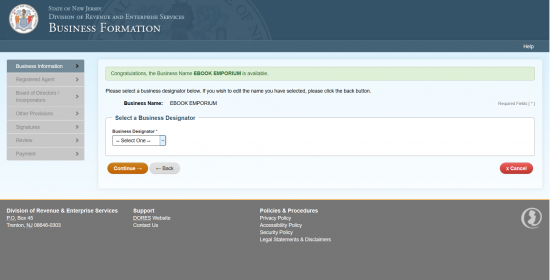 Step 7 - If the Name is available, the next page will display the statement “Congratulations, the Business Name ______is available” at the top of the page. When you have found an available Name, select the corporate designator from the “Business Designator” drop down list. For a corporation, you should choose Corporation, Incorporated, Corp., Inc, or Inc.). Once you have chosen a Business Designtor, select the “Continue” button. Step 8 - The Business Data page will have several fields: Employer Identification Number (optional), NAICS Code (optional), Duration, Effective Date, and Stock (Total Number of Shares). You may choose to enter your EIN and NAICS Code, however this is not mandatory to progress with this filing. You will need to define the Duration of this entity by entering the Termination Date in the Duration Field (otherwise, make sure it says “Perpetual”). Step 9 - The next field, “Effective Date,” will default to the current date. This will allow the filing to go into effect once submitted successfully. 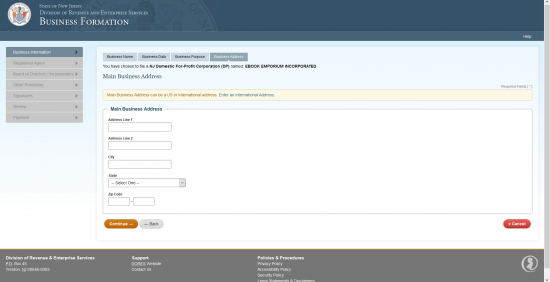 If you would like a separate Effective Date from the Filing Date, then you may enter this in the “Effective Date” field. If so, make sure it is within 90 days of the Filing Date. Step 10 - In the last field on this screen, enter the Total Number of Stock this corporation has been authorized to issue. When you are finished entering your information, select the “Continue” button. Step 12 - In the next screen, you will need to enter the “Main Business Address.” Enter the Buidling Number, Street, and Suite Number of this Address in “Address Line 1″ (if you run out of room you may continue on “Address Line 2″). Then enter the City, select the State from the drop down list, and enter the Zip Code in the “Zip Code” field. Select “Continue” once you are done. 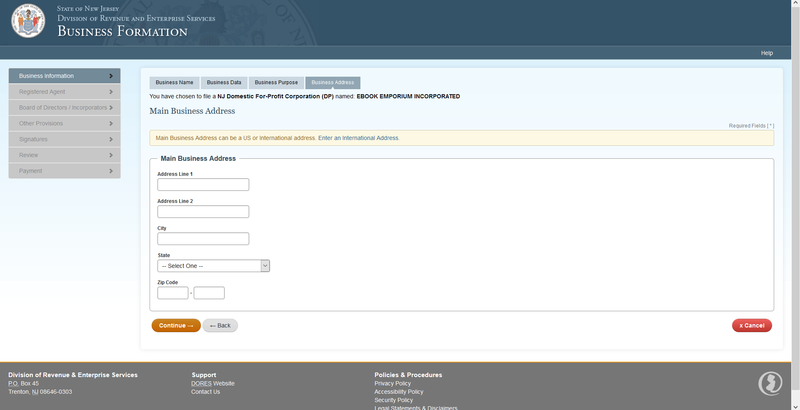 Step 14 - In the Registered Agent Details screen, enter the Full Name of the Registered Agent in the first field. Then in the next fields enter the Address of the Physical Location of the Registered Agent obtained in New Jersey. This must be a New Jersey Address. Once you are done, select the “Continue” button. Step 15 - Next, you will need to document at least one Director for this corporation. You may report up to 10. This may be done on the Board of Directors screen by selecting the button “Add New Director.” Once you do this a pop up window will appear. 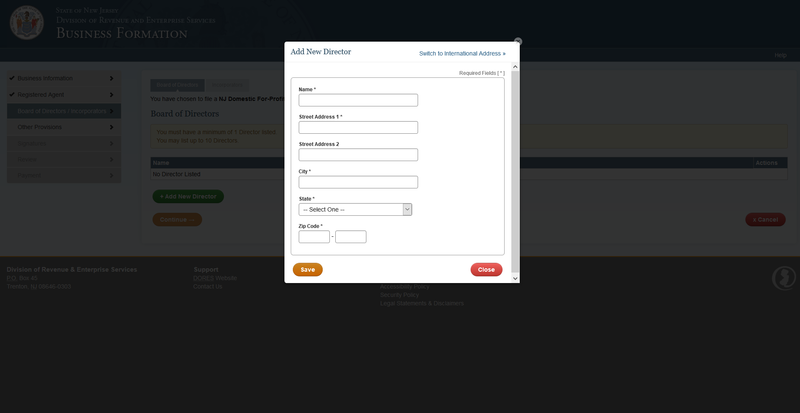 Step 16 - The pop up window will require a Director’s Full Name, Address, City, State, and Zip Code to be defined in the appropriately labeled fields. Once you enter this information for an individual select the “Save” button. Step 17 - You will now be able to see the information you entered in the table located in the center of the screen. Each entry will have a pencil button to edit the entry and a trash can button to delete the entry. You may either document more Directors by selecting the “Add New Director” button or you may move to the next area by selecting the “Continue” button. Step 18 - Next, you will need to document the Incorporators of this corporation. You must document at least one Incorporator but may not enter more than ten. Begin this by selecting the button labeled “Add New Incorporator.” This will create a pop up window. Step 21 - The Other Provisions/Additional Information screen will have two text boxes with a maximum of 400 characters. If the stock is divided into classes then report each class along with the total number of stock in that class then a brief statement regarding the relative rights, preferences and limitations. The second box will require a statement regarding to the authority of the board to divide shares and define those shares. If these boxes apply they must be filled in. If there are any other provisions to be reported, select the “Add New Provision” button. This will generate a new text box. When you have entered any applicable required or necessary to enter for the formation of this corporation, select the “Continue” button.